Every restaurant owner aspires to have a successful business that will result in a full house, however this may come as a double-edged sword. While having a full house is great business, it almost always entails a loud and un-enjoyable experience for the customers. People usually go out to eat to connect with others over a shared meal, but that can be hard when they can’t hear each other speak. Therefore, restaurant owners often turn to noise reducing products to mitigate this problem. Unlike other noisy spaces such as a gymnasium, restaurants intentionally prefer to incorporate a sleek and attractive view for their space to create a certain ambiance. Because of this, the design and physical appearance of noise reducing products are taken into consideration. Whether a restaurant owner wants a product to be directly in the open or completely hidden, ATS Acoustics has a large selection of products that can fit the needs of any restaurant owner’s vision. For a more classic look, our original acoustic panels will provide sound relief. The regular square or rectangle shape can give the space a clean, crisp, and organized atmosphere. Our selection of classic acoustic panels provide many options such as hardened edge acoustic panels, tackable acoustic panels, or even eco panels. ATS Acoustics can easily provide products for any space with our custom acoustic panels that can vary in any shape or size necessary for the project. 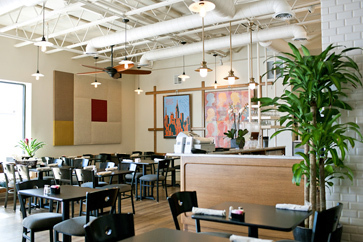 Another great option to reduce restaurant noise is ATS Acoustics’ art panels. Restaurant owners have the option of choosing between pre-made photo-prints or any custom design. These dual purpose acoustic panels will embellish the space with welcoming photos, while absorbing the excessive noise levels in the room. At ATS Acoustics, ceiling panels are a great option for the restaurant owner that wants an inconspicuous approach to reducing the noise levels in their restaurant. These panels lie flat on the ceiling and can easily blend into the structure of the building. ATS Acoustic Ceiling Tiles fit in standard ceiling grids and are highly effective noise absorbers. With our products, your restaurant’s noise level will be free from excessive reverb while also looking professional and inviting. Call 866-787-7881 to speak with one of our Inside Sales Engineers about noise solutions that fit your space and your aesthetic vision.